The Leduc and Camrose Quilt guilds are having a challenge. We are making blocks for charity quilts, we call them Friendship Quilts. There was a method to picking your colours. I have Citrus Fruit (lime green), Lilac, and Magenta. We then could use a background fabric, Black White or cream. We each needed to make one block. I know many ladies will be making many more. I have not made charity blocks for a long time so this fall I started with one block and handed it in. Then I thought that `was easy` and I have a stack now. I still have to hand in the other 7 or 8 blocks. 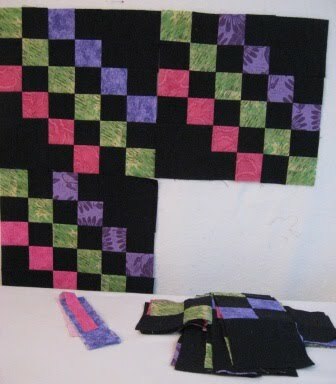 I am thinking I should make a different but matching block to go with these. Not sure and will think on this some more. Any ideas out them quilt friends (question mark key not working). 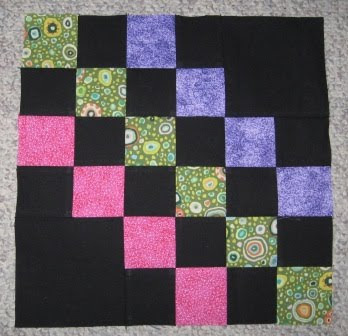 It has similar diagonal lines (uses 2 colors) so you could use the black and then a different matching color for each block.